Place potatoes in a Dutch oven; cover with water. Bring to a boil; cook 10 minutes. Add beans, and cook 6 minutes or until tender. Drain. Combine basil and next 7 ingredients (basil through garlic) in a large bowl. Add potato mixture; toss well. Add tomato, and toss gently. Cover and chill. Sterilize half pint or 4 ounce jars. Toss all ingredients in a medium sized pot. Bring to a boil, then reduce heat to a simmer. Stir the mixture every minute or so using the back of the spoon to gently break down the plum. Cook until the mixture begins to thicken. This will take between 15 and 25minutes depending on whether you are making a half or whole recipe. Remove and discard the star anise and puree the mixture until smooth. An immersion blender works great. If you do not have one, transfer the mixture to your blender or food processor, puree, and then return the mixture to the pot and bring to a simmer once more. If you plan to use the sauce within a week or two, pour into sterile jars, cover, and refrigerate once cool. If you want to preserve the sauce for later use, ladle jam into hot sterile jars. Leave a 1/2 inch head-space. Top with a new lid and band. Process in a hot water bath for 10 minutes for half-pint jars and smaller. See Home Canning Basics for more information about the canning process. 1. In a medium bowl, whisk together the soy sauce, olive oil, water, honey, ginger, lime, and garlic. 2. Cut your tenderloin into 1-inch cubes, and add to a ziplock bag. Coat with 1/2 of the marinade. 3. Place plastic bag in a small bowl in the refrigerator to marinate overnight. Reserve remaining marinade in the refrigerator. 4. About 3 hours before you’re ready to grill, combine your cut veggies and the reserved marinade in a separate bag. Store in the refrigerator until it’s time to grill. 6. Thread your pork and veggies on separate skewers, as cooking time will vary. 7. Place the pork on the grill first, adding the veggies after about 4 minutes. 8. Grill until pork is cooked through and veggies have a light char. 9. Carefully remove from skewers – – watch out as ends will be hot! 1. Preheat oven to 450 degrees. 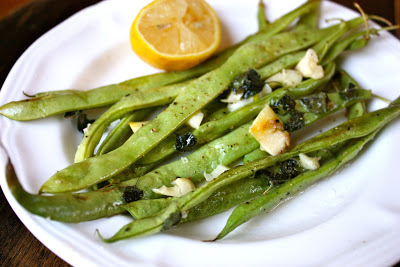 Toss the green beans with olive oil and salt and pepper, spread them on a baking sheet and arrange the garlic on top. Place the green beans in the oven and roast for 8-10 minutes, until beans are just tender. 2. Sprinkle the oregano on the green beans and return to oven for 1-2 more minutes or until oregano is wilted. Remove the beans from the oven and set aside to cool slightly. Chop the roasted garlic and fold into the green beans. Squeeze lemon juice on beans just before serving. Season to taste with salt and pepper. Serve green beans warm. To Cook Eggplant in Oven: Adjust oven rack to center position and preheat oven to 375°F. Line a rimmed baking sheet with a double layer of paper towels. Spread eggplant slices over towels in a single layer and top with a second layer of paper towels. Top with a second rimmed baking sheet. Bake until eggplant slices are easily compressed, about 30 minutes. Remove from oven and press down on top tray to compress slices. Let cool, then transfer eggplant to a large plate and continue with step 3. Adjust oven rack to upper-middle position and increase heat to 400°F. *To freeze, double-wrap the torte in foil, place in a plastic bag and seal.